It is a reprint of the essay published in the XIII issue (1995) on the topics of this issue. It's an overview, especially on Greek comic and epigrammatic poetry (with Italian translation), about the metaphor of making poetry as cooking. Focus has been put on Strato and Agathias. Conceived as a short anthology, this contribution discusses and historicizes nine Arabic poems connected with food from the Abbasid epoch to the present. An Italian translation of each poem, from literary Arabic or from an Arab dialect, is presented. Essay about the so called "banquet poetry" of the Russian poet Gavrila Deržavin (1743-1816), including passages of some poems (Invitation to lunch, To Eugene: Life at Zvanka, Praise to the country life and others) which are commented and partially translated in Italian. The focus of the contribute is on the nature of "picture poetry" of Deržavin's texts is underlined, and on its position of creating a traditional genre in Russian XIX century poetry. A transcendental gastronomy? On Baudelaire’s Gâteau. The author aims to focalize on the new representation of nourishment and its social rituals in the modern culture. Bread, which has been considered, according the christian tradition, as a symbol of spirit, is now depreciated: the increasing industrial production and the scientific approach to world, togheter with materialism and sensualism, lead to treat nourishment as a symbol in itself, thus encouraging sophisticated food. A major rule has been played by Brillat-Savarin’s Physiologie du goût, which attributes food a double token value: at the same time imaginative and representative of the new social status of the bourgeoisie. In his prose poem Le gâteau, Baudelaire is ironic about this self-representation of food in materialist society. Bread, as a forgotten good and empty sign, will be reinvested of a new rule: it will become the symbol of exchange in literature. First Italian translation, by Camilla Miglio, of a long poem by Gertrud Kolmar on "poor" food, with introduction and commentary by Vanda Perretta. This essay outlines the role of food imagery in American poetry from the colonial times to today. Through a selection of major authors and texts, it highlights the poets' various usage of the culinary art offering a verse itinerary that crosses ages and generations. From the mythical meal of the Pilgrim Fathers with the native Wampanoag in the autumn of 1621 to the theme of anorexia in contemporary times, it mainly focuses on food as a tropological devise to vehicle the authors' pooetics and their responses to social, political and aesthetic changes in the United States. 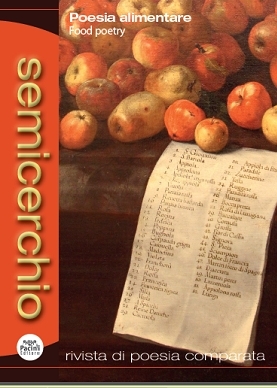 Updated reprint of the essay already published in "Semicerchio" XV-1993. The article is divided into different sections. In the first, Chiara Elefante introduces a short prose work by Yves Bonnefoy, Une heure dans ce journal que je ne tiens pas. The text, unpublished in Italy, was written by the author for the catalogue of one of his English-speaking publishers, Naveen Kishore, editor of the independent publishing house Seagull Books, established in Calcutta in 1982. The text is the imaginary account of one hour as it could be noted down in a diary. However, that diary actually exists only in a dream, in a ‘hybrid’ space between illusory imagination and existential reality. In the second section, the text is first presented in its French version, then in its Italian translation (by Chiara Elefante), and finally in its English translation (by Hoyt Rogers, one of the most important English translators of the French poet). In the third and final section, Yves Bonnefoy answers – in French – the questions raised by the text for the two translators, Chiara Elefante and Hoyt Rogers. Questions concern the diary form and the reasons why Bonnefoy never kept one, the relationships that the poet sees between poetry and mathematics, and finally the connections that can be forged between existential temporality – measured in hours, in everyday moments – and the temporality of poetry writing, which aspires to moments of ‘plénitude’. This essay is about growing into a «practitioner of poetry», and about all the challenges and rewards of such an endeavour. It starts with an analysis of the language of poetry and of the characteristics of the poet’s peculiar English, to move on to several considerations about being a woman (and “postcolonial”) writer in India and to various suitable definition of poetry in today’s globalized society. Poetry as a «feral language» to check the impending «terror of voicelessness» and the risk of adopting the «readymade language» according to the Western standards, also counter the expectations of certain short-sighted critics. To be a poet means to be an «eavesdropper», a good listener and a practitioner of an alchemical art, rooted in the long legacy of feminism and in the Indian spiritual tradition which holds that the journeys of mind and heart – jnana and bhakti – go hand in hand, thus strengthening the resolve to write from a place that embraces idea and feeling, precision and passion, the abstract and concrete, without being buffeted about by a cultural ethos that requires a choice. A poet should write from a place that includes mind, body and what often seems like new heresy of our times: the spirit. The interpretation of Incontri e agguati (2015) by Milo De Angelis shows in which manner Poetry today qualifies itself like exclusive space for the representation of Tragedy of present. The text specifically deepens the theme of confession, and tells the time of assassins. The verse delays “au-ralenti” the crime, the confession increases the act and dilates the space of Conscience. For this reason the poet adopts an exergue referring to the famous verse of Ballands from the Prison of Reading by Oscar Wilde: «Yet each man kills the things he loves». Interpreting the dynamics of this poetic tell, the essay orients its focus on the relations between four characters: the principal voice in the text, the assassin’s voice, the spectre-victim, the figure of Death.